Investigators are focusing on a series of meetings held by Jared Kushner, President Trump’s son-in-law and an influential White House adviser, as part of their probe into Russian meddling in the 2016 election and related matters, according to people familiar with the investigation. Kushner, who held meetings in December with the Russian ambassador and a banker from Moscow, is being investigated because of the extent and nature of his interactions with the Russians, the people said. 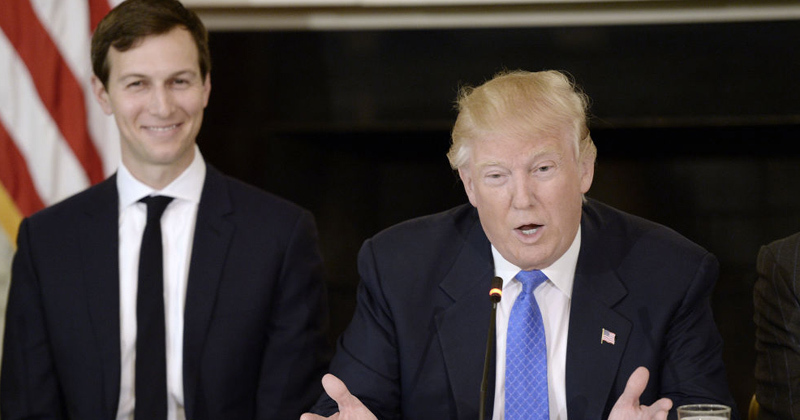 FBI agents also remain keenly interested in former Trump national security adviser Michael Flynn and former Trump campaign chairman Paul Manafort, but Kushner is the only current White House official known to be considered a key person in the probe. The Post has not been told that Kushner is a target — or the central focus — of the investigation, and he has not been accused of any wrongdoing. “Target” is a word that generally refers to someone who is the main suspect of investigators’ attention, though prosecutors can and do bring charges against people who are not marked with that distinction. In addition to possible coordination between the Kremlin and the Trump campaign to influence the 2016 presidential election, investigators are also looking broadly into possible financial crimes — but the people familiar with the matter, who were not authorized to speak publicly, did not specify who or what was being examined. In early December, Kushner met in New York with the Russian ambassador to the United States, Sergey Kislyak, and he later sent a deputy to meet with Kislyak. Kushner also met in December with Sergey Gorkov, the head of Vnesheconombank, which has been the subject of U.S. sanctions following Russia’s annexation of Crimea and its support of separatists in eastern Ukraine. In addition to the December meetings, a former senior intelligence official said FBI agents had been looking closely at earlier exchanges between Trump associates and the Russians dating to the spring of 2016, including one at the Mayflower Hotel in Washington. Kushner and Kislyak — along with close Trump adviser and current attorney general Jeff Sessions — were present at an April 2016 event at the Mayflower where then-candidate Trump promised in a speech to seek better relations with Russia. It is unclear whether Kushner and Kislyak interacted there. In many ways, Kushner is a unique figure inside the White House. He is arguably the president’s most trusted adviser, and he is also a close member of the president’s family. His list of policy responsibilities is vast — his foreign policy portfolio alone includes Canada and Mexico, China, and peace in the Middle East — yet he rarely speaks publicly about any of them. A small group of lawmakers known as the Gang of Eight was recently notified of the change in tempo and focus in the investigation at a classified briefing. Investigators are continuing to look aggressively into the dealings of Flynn, and a grand jury in Alexandria, Va., recently issued a subpoenas for records related to Flynn’s businesses and finances, according to people familiar with the matter. Separately from the probe now run by Mueller, Flynn is being investigated by the Pentagon’s top watchdog for his foreign payments. Flynn also received $45,000 to appear in 2015 with Russian President Vladimir Putin at a dinner for RT, a Kremlin-controlled media organization. Keep the popcorn coming. To be honest, I want to see Trump - and Pence - go down and whoever needs to go with them is fine with me. Russiagate: Blood in the Water?